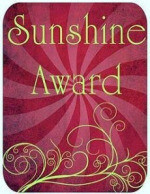 Wasn’t it a sweet serendipity to discover that one of my fave bloggers, Chelsea, nominated me for the sunshine award. First, I have to share ten random facts about myself, so let’s get right to it. 1. My name is Charlotte, but my close friends and family call me by my middle name, Michelle. I’m also known as Char, Shell, Mich, Meesh. 2. I lived in gorgeous Cancun, Mexico for almost eight years teaching English in the hotel industry and traveling throughout this beautiful land. I met my hubby there too. 3. I have been married for seven years to five different husbands, hee, hee, just joking. To one wonderful man. Which segues nicely into my next fact…..
4. I love practical jokes, pranking folks and laughing out loud. When I was younger, I loved putting salt in the sugar dish. Hee, hee. I also love putting plastic insects (specifically roaches) on people’s food, in their tubs and on toilet seats and just wait for the screams to happen. Plastic roaches, will travel. 6. I suffer from anxiety and seasonal depression, but working out and prayer are my releases. 7. I am the youngest of six crazy children. 8. I think I am the only one who isn’t watching Game of Thrones right now. 9. My favorite alcoholic beverage is red wine. 10. If I had a million dollars, I’d buy you a Llama. Just joking, I’d move to a tropical island far away from future threats of Polar Vortex’s. If you accept the nomination, please share ten random facts about yourself, and nominate five other blogs. Now, I would like to thank all the little people who made this possible. I…..wait, I haven’t won anything yet! Michelle, one of my favorite Beatle songs! Congratulations my sister, you are a radiant blessing with your sharing selfless heart. Thanks you for the kindness you have sent my way embracing my poetry. It is easy to see why you got the reward…your spirit resembles a ray of sunshine! Hugs and blessings always! Why thank-you, Wendell. I was nominated, but did not win. Who knows though? It would be wonderful. Your blog truly is my sunshine and I share and have saved many of your devotional poems in my file. God has truly blessed you with a remarkable talent. haha love all your random facts!! I didn’t know your name for the longest and I’m so glad I know it now! haha!! Have a great week girl!!! I just realized that the other day. I’ve been using my “Bezzymates” forever. Don’t know why? Another random fact. Lol! You’re not watching Game of Thrones??? Haha! No, I’m such the odd man out.